Okay, so how are we all feeling after day one’s vow boot camp challenge? 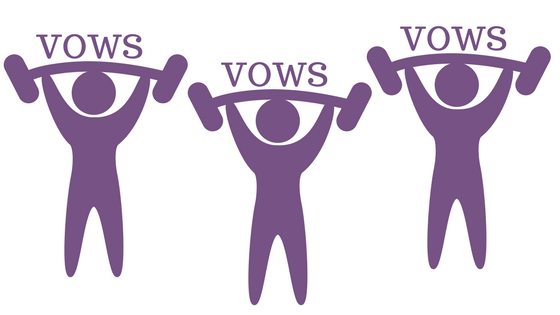 Are your plans for your vows starting to become a bit clearer and starting to take shape? I hope so. If you missed day one, make sure to recap on that session first and then come back here when you’re done. But before you launch into writing or choosing your vows, there definitely is a little bit more of preparation and planning to put in place before putting pen to paper. Something that makes writing or choosing wedding vows difficult, are all of the myths surrounding wedding vows, and if you are someone who has these myths planted firmly in your mind, it’s going to make it really hard for you to write the type of vows that your gut is telling you to. So before we get vow-writing, let’s get myth-busting first. Let’s do away with all the silly beliefs that can be unhelpful and annoying and are largely responsible for putting people off from writing personal vows in the first place. You need to be an excellent writer to write awesome vows. I cannot tell you how untrue this is. It really is. If you can speak, you can write. If you can make yourself heard, then you can write vows. You do not need to be an excellent writer or a confident writer, you just need to do your research, take your time, apply some good vow writing techniques and tune into to your heart and your mind, and you will be able to write awesome vows. That is a fact. This myth really needs to be busted, because it is responsible for creating a huge, unnecessary fear that people have about writing their vows, which they really don’t need to worry about. You have to be a confident speaker to say awesome vows. Nope. Even the most confident speaker will have some nerves when it comes to saying his or her vows. It’s natural and perfectly normal. Being shy however, shouldn’t be a reason to give up on saying vows altogether. If you really are feeling the pressure, keep your vows to a nice length that you’re happy with. Tell your celebrant that you’d rather not use a microphone (see below), and that you prefer to speak to your love bunny directly without the need for everyone else to hear. Little things like this can make it so much easier for those with less confidence to say their own vows. And so, don’t you believe it that lacking in confidence means you won’t rise to the occasion when it comes to your personal vows. You have to write long vows. I’m not quite sure where this obsession with the idea of long vows has come from, but it needs to go away. Vows should be as long or short as you see fit. There are no rules, and there are no wrongs or rights. I have seen vows which have filled an A4 sheet of paper (and more) or some which have been a short paragraph, yet because all had been written from the heart, expressing what the reader wanted to say and how he or she wanted to say it, never did any of these vows feel anything but what the reader intended people to feel. So stop obsessing with the length of your vows, just let them be what they are. I also have couples fretting over whether one of their vows is longer than the other. IT DOES NOT MATTER. They’re vows, not matching haircuts. Your vows have to be serious and solemn. Of course they don’t. We’re in 2018, not 1818. We know that getting married is a serious business, and not to to be taken lightly, but that doesn’t mean that we have to make a serious business out of it. The fact that we are stepping up for marriage in the first place means we have made a weighty decision, but the act of carrying out that decision, doesn’t need to be a serious, doom and gloomy one. Vows should reflect you, your love bunny, your relationship, your personalities, your hopes and wishes, your good and bad. Vows can be fun, can be funny and can be written to make your love bunny and those around you laugh. Serious intentions do not equate to serious actions. Okay, so I’m not saying to write a full-on stand up comedy script, but if your lives are full of laughter and humour, then why shouldn’t your vows reflect this? You have to speak into the microphone when you say your vows. I know this little myth has many people out there quaking in their boots at the thought of not only having to say vows, but also having to use a microphone to project their voice. There is nothing, written anywhere that says you have to use a microphone when saying your vows. Of course, your loved ones would love to hear what you say when the time comes to saying them, but if they can’t quite catch your words, it doesn’t really matter. What matters, is that the person standing right next to you hears your vows, and if only he or she does, then so be it. Your vows are your declarations to one another, not to everyone else there with you. So, do not feel obliged to use a microphone if you don’t want to. You have to memorise your vows. Many of my couples can’t even remember what the date is when they come to sign the marriage register, so why on earth would anyone expect them to remember a whole set of personal vows to each other? As nice and heroic as it may sound to be able to recite your vows, the reality is, your poor brain is not up for the job. The nerves, the stresses, the excitement, simply gives the brain too much to cope with on your wedding day. Reading your vows from a card can still be done naturally and with ease, and having them written down right in front of you means, you will say exactly what you’re supposed to say without giving your brain extra work. Don’t let anyone tell you you have to memorise your vows. It’s the biggest myth ever. And there we have it! Myths busted in a matter of minutes. How are you feeling? Are there some myths here that you took to be truths? Well, now you know differently. See you tomorrow for the last vow boot camp challenge to find out which category of vow-writing methods you will fall into. Will you write yours from scratch, write them using a crafted template or choose them from ones that you’ve come across? What will it be?